Although Scorpion is a relatively new company, they still managed to make a huge loyal fan base of enthusiast who love their products. The Scorpion Exo helmets Series is Specifically really popular & some of them among Best Sellers. In this post, we are going to Show you 5 of the Best Scorpion Motorcycle helmets they have to offer. Want to Check out, even more, Scorpion Options? - Scroll to the very end of this page to see even more options. 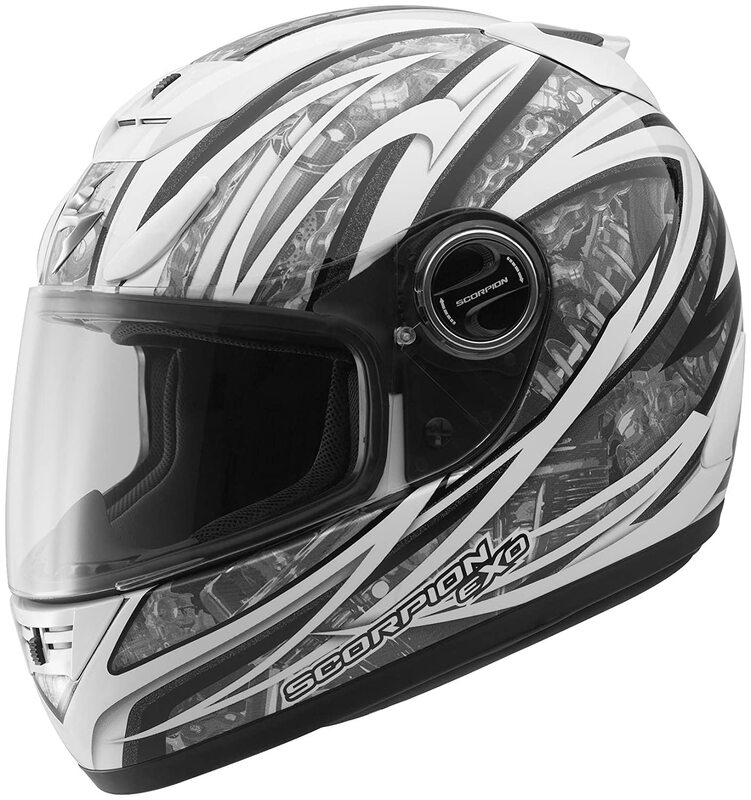 The Exo-R2000 is the company's Top of the line High-End Helmet Product. The manufacturers worked with MotoGP racers to re-think every aspect of helmet's design and they've come up with a winner. The Prominent features that make this helmet Outstanding are the Premium Feel, AirFit Cheek Pads, an Everclear Fog Free Locking Outer Shield and is Certified by Snell Standards. The company redesigns the helmet entirely. Whether you are on a track or on the street, this helmet promises to never disappoint you. TCT Composite Shell - The process consists of a proprietary 5 layer blend of interlaced and specially formulated fiberglass, Aramid and organic poly-resin fibers. EverClear No-Fog Faceshield - Optically-clear shield with state-of-the art fog free technology. Bottom Line: The EXO R2000 has everything a street rider needs. The Exo 1100 is probably one of the most famous Scorpion gear. The main reason - it packs a lot of value in an affordable price range. The Helmet is a DOT certified ( You probably know it's a safety rating ) and non Snell certified ( and that's a good thing in this scenario- as it makes the helmet really easy on the head ). The DOT rating makes the helmet extremely safe. Most of the people using this helmet have almost no complaints about it. Dual-density impact absorbing EPS Liner - Which makes the helmet absorb all of the impact energy and save your skull during a collision. Washable Liner - The helmet Smells bad after a year of use? No problem - Just clean it to Make it Smell fresh Again. AirFit liner inflation system - Self explanatory. Meets D.O.T./ECE 22.05 standards - If you don't know, the ECE is a European standard safety test. Weighs 4 lbs - Which is a little bit a problem, if you are accustomed to wearing super lightweight helmets. The Exo 1100 is fairly quiet - There is not a lot of buffeting and the wind tunnel tested aerodynamics help. Fiberglass/Kevlar Matrix Shell & EPS-lined chin bar for additional protection. Bottom Line: Awesome Helmet with almost no significant complaints. The Scorpion EXO-GT920 motorcycle helmet is a true modular helmet - There are 3 different configurations including full face and scorpion open face helmets, with the added benefits of a detachable peak visor, drop down sun visor and built in attachment ready for motorcycle communication. Which basically means you can turn it to scorpion Bluetooth helmets. To Check out More Top Bluetooth Helmets, Check out this page. This makes the Scorpion EXO-GT920 unique and gives you options that no other modular helmet can offer. Bottom Line: Excellent Helmet, You get two types of Helmet for the price of one Helmet. The Exo-C110 is an open face helmet. This Helmet has slightly better reviews than the reviewed below. The Exo-C110 has almost similar features to the helmets described above. The Exo 110 is a DOT approved half helmet. A little Problem with these types of helmets is that they don't provide safety on the chin area but perfectly does the job of saving your skull. However, it's a little bit of uncomfortable at very high speeds. Another great helmet by Scorpion company. The thing which we really like about this helmet is the graphics. This helmet comes under low price range, however, it still feels really nice and far from cheap. Fiberglass & Kevlar Matrix Shell: Quiet, Aero-Tuned Design for Wind-Tunnel Tested Comfort. EPS-lined Chin Bar for Additional Protection. AERO-TUNED ventilation system which is Adjustable, Indexed Front and Rear Vents, Create Vacuum and Maximize Airflow Through Helmet. Overall, A great helmet that provides full protection and does its job nicely. The Scorpion Exo R410 is probably the best Scorpion budget helmet. The graphics of the helmet is the key feature here. They are pretty cool. KwikWick 2 Liner - KwikWick 2 anti-microbial fabric keeps you cool and dry in warm weather. If you want to make sure that the scorpion helmet fits well on your head, you can check out our Guide on sizing here. Also, You can check out the Scorpion Official Website for complete info on size. All of the listed helmets are great options. Again, Scorpion is a great brand. You get premium stuff at a relatively low price. What Scorpion Exo helmet do you this is the best among all others? If you liked the post, Tell us by Commenting Below. Thanks!